June is Stroke Awareness Month. As the Nutritionist for Sobeys, we are partnering with the Heart and Stroke Foundation to offer you Wellness classes every Monday night of June. Last night our first class topic covered the basic of eating healthy, cholesterol, and nutrition tips that may help reduce your risk of stroke. The recipe that I prepared for my Heart and Stroke class last night was a Quinoa Greek Salad that I had altered from the Heart and Stroke’s recipe online. This recipe is fresh, easy, and delicious for summer. It ensures to include all the heart healthy ingredients and can be used as a main dish or a side to any dinner. Chickpeas: A great plant-based source of protein and fibre. The bean I’m sure you know by now is my ultimate favourite! This item has 13g of fibre per 1 cup. Avocados: A great source of heart healthy unsaturated fats and soluble fibre (6.7g fibre per 1/2 avocado). Red & Green Pepper: Peppers have high antioxidant and vitamin C content. This means they will fight off pollutants (free radicals) in the body that can cause cell damage. Black Olives: Are low in a cholesterol. A source of dietary fibre, iron and copper. However, olives are high in sodium. Make sure to rinse and drain the olives before using them in this recipe and don’t overdo it. Slice them in to thirds to make a smaller amount go a long way. 1/3 cup feta cheese (reduced fat if available), rinse and drain to remove sodium. Optional: Add a fibre and protein boost with ¼ cup rinsed and drained chickpeas or add a salted crunch with roasted chickpeas! In a small pot, cook 1 cup dry quinoa as per package instructions. 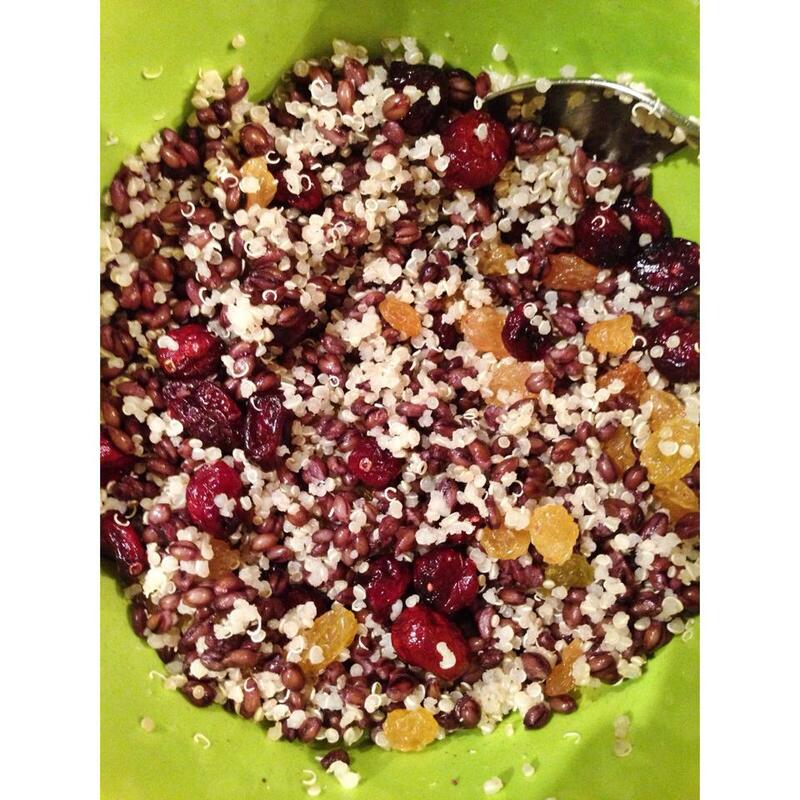 When quinoa is fully cooked, remove from heat and allow to cool. Place in the refrigerator while you are preparing the rest of your ingredients. Prepare diced vegetables and crumble feta cheese. In a large mixing bowl, stir the veggies and cheese into the cooled quinoa. Pour the dressing over quinoa mixture and toss. Choose healthy fats (UNSATURATED fats), avoid saturated and trans fats where possible. Limit added sugars: less than 12 tsp or 48g of added sugar a day!! This cold quinoa and barley salad is fresh and filling to add to your summer meals. Fun fact: Quinoa is a complete vegetarian source of protein…meaning that it will provide you with all the essential amino acids you need to consume in your diet. 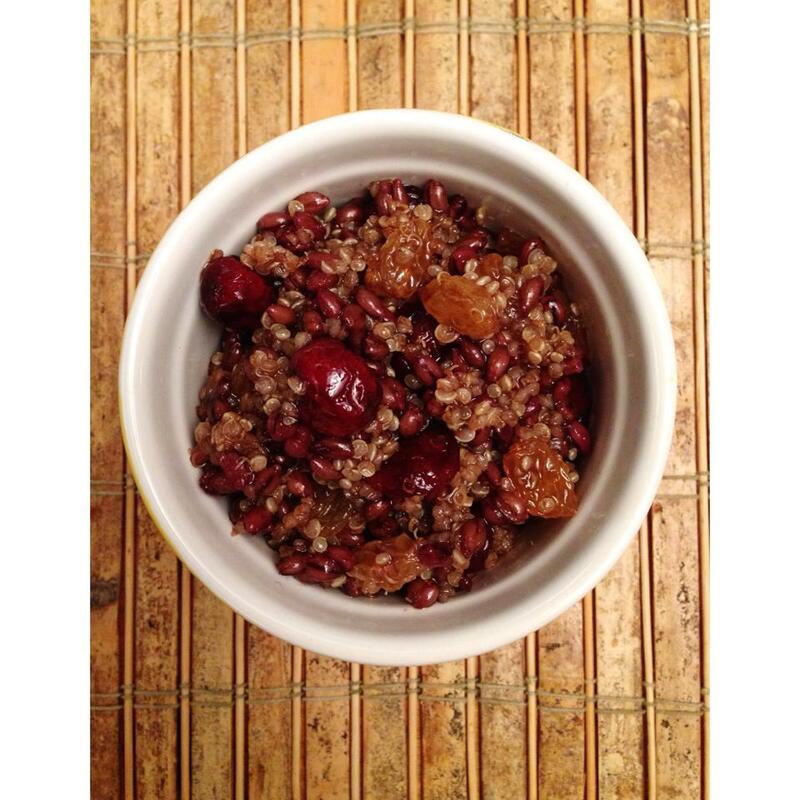 Quinoa is higher in protein and iron than most grains. It is also gluten free and has a low glycemic effect on your body. What does low glycemic effect mean? Low GI foods raise your blood sugars/glucose slowly. Therefore, you do not get a rapid increase and rapid drop in blood sugars leading to hunger/symptoms of fatigue very shortly after eating. For example, high GI foods such as white bread give you a quick burst of energy (rapid rise in blood sugar) followed by a rapid drop (leading to fatigue/hunger). The low GI of quinoa makes it a great food source for those with diabetes. 1. Cook the quinoa and barley in advance and store in fridge until chilled. 2. Combine all ingredients in a bowl and store in the fridge. 3. Eat chilled 🙂 … Sometimes I will top it with cashews/nuts for an extra crunch!